September is a memorable time of the year for us. It was 3 years ago that we launched LIFE PROOF BOATS at Seattle’s annual end of season, Boats Afloat Show. On display at that first boat show we showcased 6 very distinct models; including a 20’ Cuddy Cabin, 21’ Runabout, and most notably our 30’ Convertible. Here we are 3 years later, with an ever growing brand following and continuing the trend of using this show to spring board some of our latest models out in the open for public consumption. At this years show we brought over 5 boats for display with a full array of unique features. Our most popular feature being, you guessed it, our drop bow door! Starting from left to right at this years show you would of seen: a 33’ Full Cabin with a 500HP Cummins Diesel Engine coupled to a Hamilton 292 waterjet, a 23’ 300HP Volvo D4 Sterndrive Hardtop, a 18’ RIB Tender, a 31’ GT Coupe with Mercury’s latest 300HP Verado’s, and a 27’ Full Cabin with a pair of Honda 250 IST engines. The show was a huge success. We got to meet a lot of great people, both in the industry and potential new clients. From now through the Miami show is really the hottest time for our sales team, with, ironically, the summer months being the slow time of the year. I guess everyone is busy out on the water! This month we are going to talk about our outboards since they really are the heart of the boat. Outboards are quickly growing to be the choice for the mainstream of boaters under 45FT. With even some of the larger 45-50ft center consoles putting quintuplets on the transom! Now boats are much more unique than cars, one of the main examples of this is just in how diverse the power plant options can be. Even on the same boat model you can have 10 or more available engine configurations. Of those options, they may come from all over the world. Our 31’ length hull models are a perfect example of this. A client can choose to go with a set of 250HP outboards from Japan or a set of 400HP outboards from the US. Of course these will have dramatic impacts on the boats characteristics so we help guide the client to the best fit for their application. And just to make it interesting with the lower weight of Mercury’s new 300R motors, you can now put three of them on the back of most boats originally rated for twin 350’s. The other reason you should look at these new 300’s is because unlike most of the other engine’s in this HP class, they are recommended for 87 octane. In the Pacific Northwest, for example, we are limited to 87 octane due to supply on the water. It’s rare to find a location that supply’s a higher octane on the water unless you pull out your boat and take it to a local gas station. One of the most asked question we get is what is the best outboard on the market. That’s a great question but it requires a politically correct, complex answer. 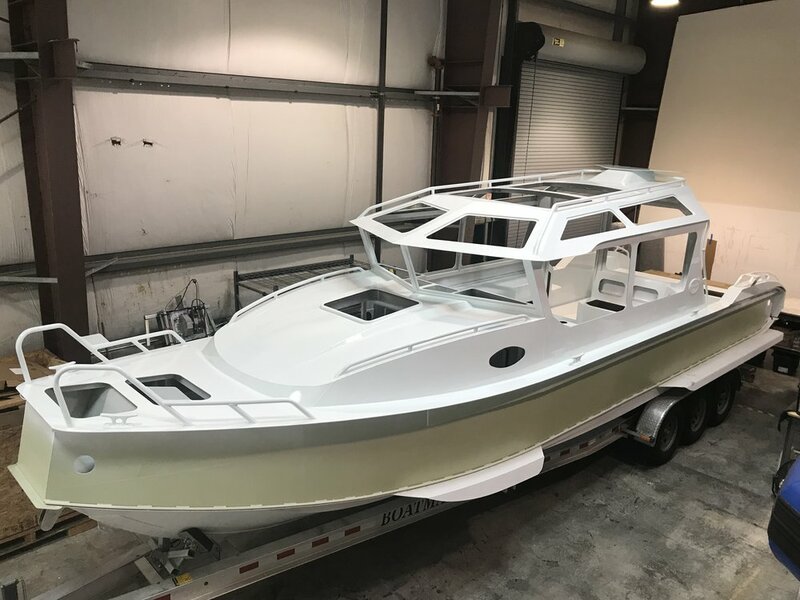 At Life Proof Boats, we can supply your boat with just about any major OEM brand. Mercury engines in the 250-400HP range are so quiet you can often forget they are even on. They also deliver the power smoothly and offer a wide range of factory options. They do make the boating experience more comfortable, and fun. Honda engines are known as dependable and affordable. Built on the foundation of the historically dependable car engines, the marine line follows suit with proven dependable engines that also tend to lead the pack with fuel efficiency. They also have not changed much in the last decade so they have a very good database of information on how the engines are performing. It’s exciting to see what’s going to come out next from Honda as they begin development of the larger HP models. Last year a team of six engineers from Japan sat down with us to pick our brains on what design features & characteristics are the most important to us. Suzuki’s are also a great option in looking for a dependable, affordable engine. While their market share is not as large as Mercury or Yamaha, clients that have them seem to speak highly of them. I have seen repeat clients, so they are proving to be a great alternative for a lot of people. Unveiled last year, the dual prop outboards from Suzuki are great candidates to heavier boats since the dual prop configuration will allow for less “slip”, and more of that HP being put to use. But with dual propellers the gear case is not as slim as some of the single prop faster lower units. Last but not forgotten BRP has bucked the trend of the 4 stroke engine and continues to refine the 2 stroke. They have shown it can go toe to toe with the other 4 stroke models. They do have a following of clients who want nothing but Evinrudes on their transoms. One of their latest advancements has been their incredibly affordable outboard joystick system. At a 1/3 or less the cost of the other brands joystick system, the I-Dock system from BRP offers a lot of the same features. Making it incredibly popular with clients. Whether you burn oil or change it, today’s outboards are all really competitive and similar when it comes to dependability and features. The first step in choosing your engine brand is what does your local service center maintain. With growing part counts and electronic components on these sophisticated engines, buy one that you know can be diagnosed and serviced by your trusted, local service center. And don’t forget to check with your local marinas first to see what octane level you have access to, because your 350 may only be producing 315 due to low octane ratings. The weld shop is busy this month as we continue to gear up with personnel and equipment. With the continued growth we decided it was time to purchase a press brake, so we found a 130TN 12’ Accurpress which fit the bill nicely. Currently in the shop are four full cabins, two 31FT model’s and two 33FT model’s. 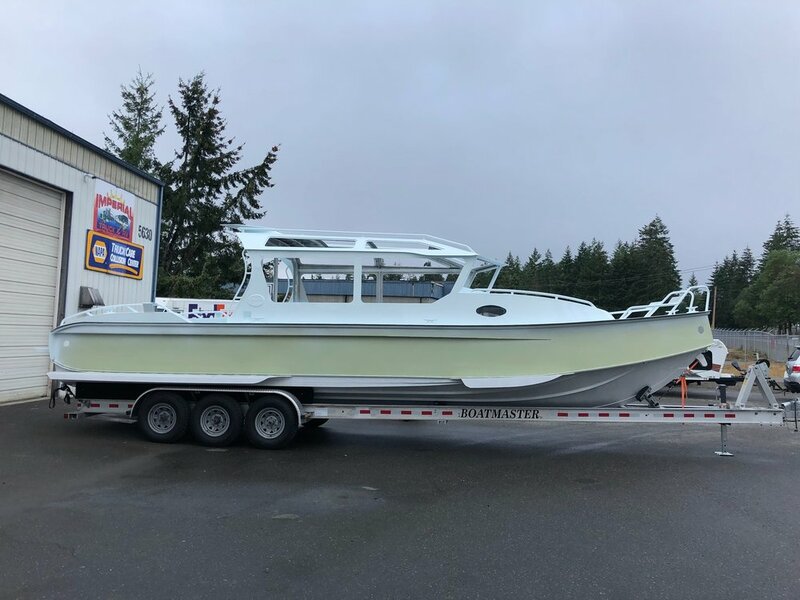 In the rigging shop we were busy working on a 40FT Snorkel Boat heading to Maui, a 29FT Full Cabin, an 18FT RIB Tender, and a couple 21-22FT Law Enforcement Boats. September is always a fun month. With the end of the season brings reflection on the summer, and new ideas as clients think about the possibilities of next summer. We also ran a national campaign with Passengermaker and Power and Motor Yacht magazine. This sparked the new design at the top of this newsletter. Shown here as a 41FT length we also have it drawn as a 35FT length. And we feel we can be competitive in pricing to any of the larger fiberglass T-Tops.